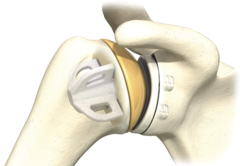 There have been many advances in shoulder joint replacements over the last 20 years. The first generation artificial joints were basically one size to fit all, but of course people are of all different sizes and so many did not fit all that well and would loosen. 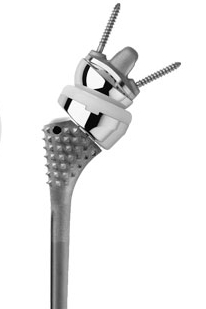 The second generation of shoulder prostheses allowed for different sizes of the ball and socket as well as the length and width of the arm bone so allowed better fit and function. The third generation of shoulder joint replacements were only released for world distribution in 1999 although designed and trialled for a period of 8 years in France (Walch, Boileau) with impressive results. These allow the normal shape of the patient's joint surfaces to be exactly reproduced in surgery, so the patients muscles can act normally and therefore better function is achieved as well as the good pain relief. The old worn out ball of the head of humerus is removed and a highly polished metal surface (part of a sphere) is replaced on the humerus which exactly fits on the cut surface. 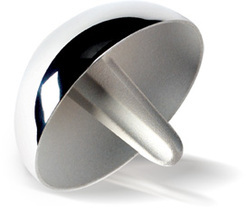 Usually a plastic cup is cemented onto the scapula (shoulder blade) on which the smooth metal slides. Thus friction is minimised, the painful surfaces removed and the muscles which move the joint returned to their correct length. We encourage early movement of the shoulder at first in a sling but this can be removed quite early for periods but will be useful for up to 6 weeks. Hydrotherapy is extremely useful to help relax muscles, regain movement in a soothing less painful environment and can be begun after 3 days if facilities are available, as a waterproof dressing is applied in theatre to cover the wound. The sooner the return to function the better the eventual result. For Cuff Arthropathy when there are no muscles or cuff remaining about the shoulder joint (which is also worn out), there used to be no good solution. The standard artificial joint relies on the surrounding muscles to hold it in position and to move it. When these are not present then the metal prosthesis would migrate upwards and erode the bones causing more pain and trouble sometimes necessitating a joint fusion (occasionally, but not well tolerated be older people). A Reverse shoulder prosthesis has now been available in Great Britain for some years and is designed for this condition. It holds the shoulder down and does not let it migrate upwards to erode the bony arch and keeps the joint centred on the shoulder blade. Also it allows the remaining outside muscle (the Deltoid), to act in a more mechanically advantageous manner so that control of the joint is regained, often quite soon after the surgery. This allows patients to open doors, reach for cupboards, eat, attend to their hair and other personal care without holding their arm with the other hand, in addition to reducing the pain - which is the primary aim. Mr Hamlet has more than 10 years experience with this type of implant with consistently good to excellent results. 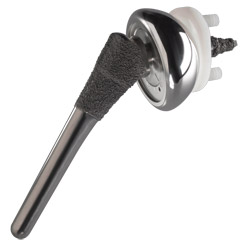 It should be remembered that this implant is used to improve an otherwise very poorly functioning shoulder. Patients usually stay only one or two nights in hospital for pain relief and physiotherapy, until they are comfortable enough to go home. Function returns quicker than conventional replacement but there is a limitation of internal rotation (arm behind back - can usually reach bottom but not bra strap).